Having been on the program for several years, we are always on the look out for ways to help our clients integrate the program into their lives. Taking the right supplements is an essential part of a personalized program and we would like to suggest a simple tool which will not only save you a lot of time and frustration but also help you stay on top of your supplement needs ad re-order ahead of time. 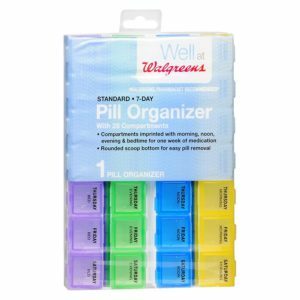 Introducing the Pill Organizer, this specific organizer actually has deep enough compartments to handle the heaviest programs. I like to fill the compartments on Sunday morning for both myself and my wife, the process takes less than 10 minutes and we are set for the week. You will notice a “bed” compartment, this one is perfect for GB-3 and Endo-Veggies. We like to share little ways to save money and shop smarter. One way is to use a website called Ebates for all your online shopping. You might have seen ads on TV (if you still watch TV). Ebates is a free member based website that offers it’s members discounts and cash back to thousands of online stores. The way it works is very simple: Ebates send a member to Target.com the member makes a purchase on the site. Target will give Ebates a % of the sale that they referred. Ebates shares part of their referral commission with you. Does that make sense? So why am I sharing this with you. Well when you sign up with Ebates you will received $10 cash back after your first $25 purchase on any of their listed stores. Ebates happens to offer 4% cash back at Vitacost, one of the best sources for natural products and supplements. For example you can get Natures Way Kelp for less than $8 while still enjoying 4% cash back. -> search for Walgreens Standard 7-Day Pill Organizer & EZY Dose Pill Pouch the purchase will be a little over $10 which you will get back via ebates in about a month. Ebates will either send you a check or send money to your paypal account every other month. How do you organize your supplements? Share your ideas and comments with us. Washing your hair: Make sure your hair has been washed before sampling it, preferably with a mild soap or with shampoo, within 24 to 48 hours. Using a conditioner or rinse is okay, but it would be best to use only a mild shampoo for the best results. Do not place other products on the hair just before cutting the hair sample such as hair cream, hair spray or others. Tints, dyes, color rinses (such as henna) and highlighting: These can be on your hair when you cut a sample for analysis. Most shampoos, rinses, conditioners, tints, sprays and other hair products don’t affect the test for three reasons: First, most of these products do not contain minerals, which is all the hair test measures. Second, the hair is only 10-15% porous. This means that not very much is absorbed by the hair. (The scalp, however, is porous and can absorb many chemicals). Finally, most shampoos are only applied for 15-30 seconds, not long enough for much absorption. The more natural the hair, however, the better. Grecian Formula contains lead and should be avoided. Head & Shoulders Shampoo contains zinc and could elevate zinc readings. Selsun Blue Shampoo contains selenium and could elevate this reading. Bleaches and Permanents: After a bleach or permanent, especially a beauty parlor permanent, wash your hair four or five times before sending in a sample. The chemicals used can affect the hair structure. However, the hair will recover after several washings, as a general rule. If you have a water softener in your home, and you use softened water for bathing, it might influence the test: In this case, please wash and rinse your hair TWICE with either distilled or reverse osmosis water before you sample your hair. This should remove residues of salt or potassium from your hair. Distilled or reverse osmosis water can be purchased in jugs at the supermarket. The best tissue for sampling is one that is clean, fast growing and that grows evenly. Head hair fulfills these requirements better than any other type of hair. The normal values used in the hair mineral analysis test have been established based on head hair samples. The major ratios are the same in the pubic and head hair samples. However, all of the levels tend to be higher in pubic hair. The difference may be due to the slower growth rate of pubic hair and that it is more protected from the elements than head hair. We ask that you do not mix sources, such as half head hair and half pubic hair. This will cause inaccurate readings. Hair from a beard, other body hair or finger nails could be analyzed, but the laboratory has not performed extensive testing on these. Scissors should be clean and sharp. Steel scissors are better than aluminum scissors. If plated scissors are used, be sure the plating is not peeling off, which could contaminate the sample. Be sure to sample enough hair. If you have received one from us, the paper scale should tip to the other side. We recommend cutting several snips of hair as close as possible to the scalp. You may cut the samples from along the sides, top or back of the head. Place the samples on a clean table with the cut end facing you. Now cut off any long ends of hair that are over 1 inch (or about 2 centimeters) long. Shorter hair is fine. However, the long ends of hair are older and are not as good for sampling. The new hair, near the scalp, is much better. You will have enough hair when the 1-inch (or less) cut samples will fill an ordinary tablespoon. Combine these and place in a clean, paper envelope. Write your name, age and date of sampling on the envelope. Short hair can be a challenge. A thinning shears is often helpful. Thinning will allow a more even sampling without leaving any “holes” or uneven areas. Thinning shears are best when the hair is less than 1 1/2 inches long. 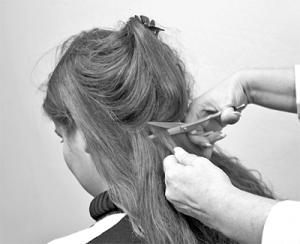 One method is to make a cut with the thinning shears, then pull the scissors away from the head, holding them parallel to the head. The cut hair will come away in the scissors and can be scraped into the envelope. Retest samples should be taken from the same area as the original sample, if at all possible. This assures continuity from sample to sample. However, it is not necessary to find the precise strands of hair for the next retest. Simply take the sample from the same general area. Also, head hair cannot be compared to other types of hair so be sure that the second hair sample is from the same origin as the first. I prefer the use of hair test to blood tests because I feel they are more accurate indicators of the overall metabolic trends in the body. When you understand how the blood operates, you will see why I say this. Blood is a transportation medium. It is the “highway system” of the body. The components of your blood must remain fairly stable at all times – or you would die. Acidity, alkalinity, levels of certain nutrients, etc., all must remain within fairly tight limits. This equilibrium, or balance, is INCREDIBLY IMPORTANT TO YOUR HEALTH. First example: Your blood test shows adequate levels of calcium. Does this mean your calcium metabolism is good? Not necessarily. It could be that your body is robbing calcium from your bones and teeth to support a major organ. A hair test would show the actual mineral status of your tissues. A blood test could miss it. Second example: After a person ingests lead, a poisonous metal, the lead levels in the blood stay high for 30 days. Then the lead disappears. Is it gone? No. The answer is that the lead has now been removed from the blood. It is being stored in the tissues and would show up in a hair test – not a blood test. The quantities of minerals being measured from the blood are 1,000 times smaller than those found in hair tests. The standard of mineral measurement from blood tests is a nanogram. This is one-millionth of a gram. 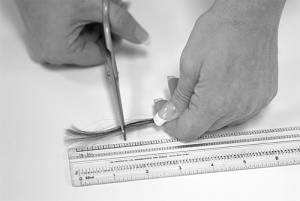 In a hair test, we use measurements of a thousandth of a gram – 1,000 times larger. For this reason, I tend to prefer hair tests. I think it is easier to get experimental error when you are working with the smaller quantities of minerals found in the blood. Also, if we were to test blood for all the minerals that we do in hair tests, the cost would be prohibitive. This is because of the sophisticated tests and equipment needed to measure quantities of minerals that small. I think the cost would be hundreds of dollars, maybe even more. A blood test can be too easily influenced by events that happened only hours or even minutes before. In time, like overnight, the blood would regain its long term stability. But over short periods it can be volatile. For example if you ate several candy bars or had a sugary breakfast, your blood sugar would rise. If you took a blood test shortly afterward, it might indicate high blood sugar or even diabetes. Can you see the problem? I realize that people who take blood tests are told not to eat any sweets or food for so many hours before the test. That’s not the point. the point is that the blood is capable of such big fluctuations over such a short time. Another quick example: If someone insulted you and got you upset, your blood chemistry, in some ways, could change within seconds. A test taken at this time would not be completely accurate. By contrast, your hair is more stable. It takes several weeks to change the basic mineral pattern of your hair. Short-term variations like what you had for breakfast or what kind of day you had do not affect the hair test. That is why I feel hair analysis testing is more accurate than blood serum analysis for picking overall metabolic trends. I am not saying that blood tests do not have value when properly interpreted. What I AM saying is that hair tests can reveal to us far more information, and at far less cost. That is why I use them. Ideally, hair tests and blood tests may be used in conjunction with each other. * Lead will show up in blood tests if it has been less than 34 days since the lead was ingested. If the person is getting lead on a continual basis, like a child eating paint chips, or a person breathing polluted city air, then the blood will, of course, detect the problem.